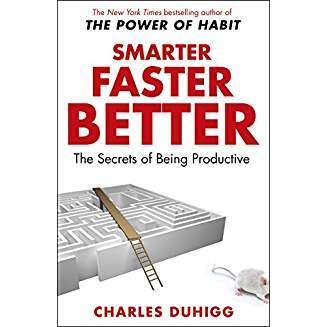 Book Review – ‘Smarter Faster Better: The Secrets of Being Productive’ by Charles Duhigg. Having previously read Duhigg’s book on Habits I must admit this one is not as good a read, Habits was exceptionally well written and packed with incredibly interesting material. However, smarter faster better is still full of some very interesting information and very well presented, I think some of my slight disappointment is tainted by having previously read quite a bit of what Duhigg covers, so maybe that tainted my experience. There are some really interesting anecdotes that certainly help us to see how we can become more productive but the stories dominate the narrative. I enjoyed the book overall but was left wondering how this moved me forward in terms of business skills, that is why I bought it after all. If you are new to business management then this is a good starting point in your education, for those with some experience there are some very interesting ideas presented and Duhigg does tell a good story. The book, which is divided into a series of chapters (Motivation, Team, Focus, Goal Setting, Managing Others, Decision Making, Innovation, Absorbing Data, Appendix and Notes), is well laid out and organised but I got to the end feeling something was missing if much better informed, a strange feeling. Would I recommend it? Well that would depend on what you want from it, will it make you, me, smarter faster better? Who knows, for me nothing really jumped out and said I must do this…… Who knows it may for you, as I said earlier it depends where you are starting from.